It generally has the nicest looking UI that I’ve seen in any space 4x games. It has a useful tutorial system, as well, which helps out new players. There were a few issues with the User Interface, though. These problems tended to be minor, but it would’ve made the game more playable if the game developers had handled them well. First, the game starts up in 1024×768 resolution. Since my monitor is 1600×900, it stretches the image to fit my screen, which lead to distortion and made the text a little blurry. After a number of hours, I happened to poke around the options window and I found an option to change the resolution to 1600×900. I bet there’s a large number of people playing on a blurry screen because they didn’t know that. It took me a long time to figure that out (my last review was actually done using 1024×768 images, so I obviously hadn’t figured it out back then, either). Second, there were times when things were confusing and the game developers could’ve fixed the confusion by using some well-placed help text. Here’s two examples from my recent game. I wasn’t able to send ships across the wavey lines and didn’t know why. I’d select my fleet and right-click on Asellus, but my units wouldn’t move there. I had to exit the game and google it. It turns out that the wavey lines are wormholes, and you can’t travel over them unless you have a particular technology (“Applied Casimir Effect”). It seems like the game designers could’ve given some indication of this – maybe when I tried to send my fleet there, and the fleet ignored my orders, they could popup a window or help text explaining why I can’t move there. The same thing happened a few turns later when I tried to move to an enemy star system. I had sent a scout there earlier, but now my fleet wouldn’t move there. At first I thought there was something wrong with fleet movement, so I tried sending them to a different star system, which worked. Again, I exited the game and looked it up on google. 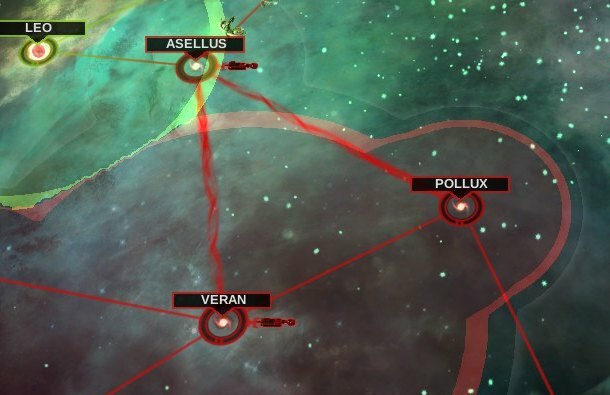 It turns out that once you have discovered that a star system belongs to another player, there are only two ways you can move there: if you are at war, or if you have an “open borders” treaty with them. Again, there was no indication of why I couldn’t move my fleet to his star-system – the game simply ignored my mouse-click. A popup message would’ve been helpful. These kinds of little improvements would make the game easier for players. It’s also the kind of thing that you learn and remember if you play the game often enough, but it makes things more difficult for new players. The game has a number of little issues like this that could be cured with some extra work. 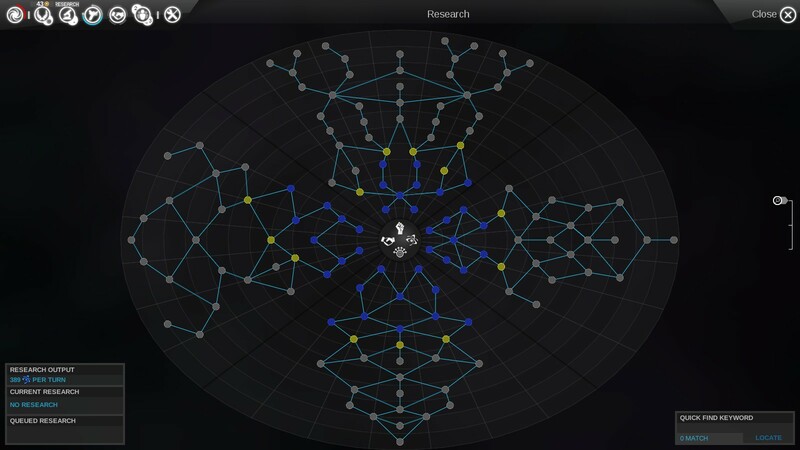 The technology tree is split into four categories (Combat, Trade/Diplomacy, Applied Sciences, Expansion/Exploration). You begin in the center of this tree and move outward. If you thought that the “Magnetic Field Generators” would cancel out the “EM Radiation anomaly”, because that makes sense, you’d be wrong. No, the “Magnetic Field Generators” do not cancel out the EM Radiation anomaly. They increase science by +40 on the planet (regardless of whether or not that planet has an EM Radiation problem). Huh? 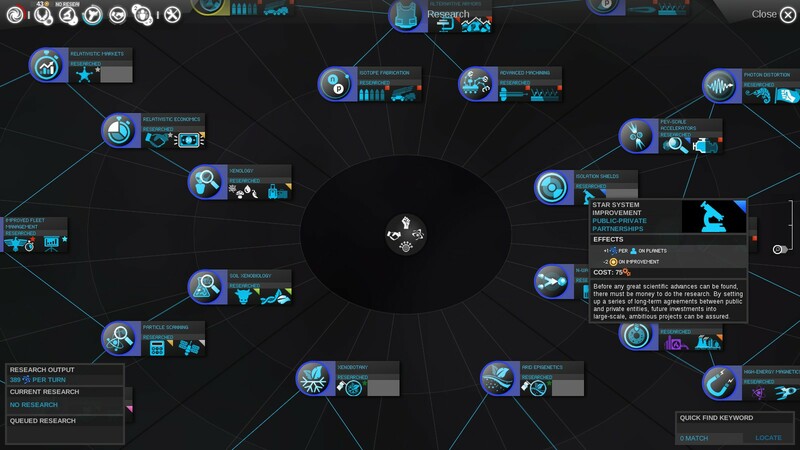 I generally felt that the technology popup window could include some more valuable information, such as contextual information about how much the technology would help your empire. For example, there are technologies which allow you to terraform arid planets. But, how many arid planets are there in the star-systems you control? If there are zero, maybe I’d be better off researching the technology to terraform arctic planets, instead. That contextual information would be useful. As things stand, I have to go “are there any arid planets I want to terraform?”, switch out of the technology view, go research the planets in my star-systems, and come back with an answer. It’s tedious. The game doesn’t have you manage each planet individually. Instead, you manage the star system as a single unit. That’s fine and it saves you some work since you have fewer build queues to worry about. They have some useful popup information for each of your build options. The “Sustainable Farms” improvement won’t do anything for my lava planets. If I chose to build it, it would cost me 2 dust/turn and provide me with 0 additional food. 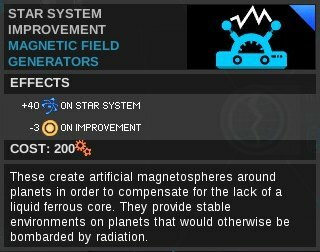 It would be helpful if the game would have contextual help that would tell me that the improvement is useless for this star-system, or at least allow me to remove the improvement from my build options. In ten turns from now, I’ll probably look for more things to build here, and I’ll do the exact same calculation and discover (again) that the improvement is useless. And then I’ll do it again in 20 turns. This is probably the one thing that annoys me most about this game. This simple fix would improve the game significantly for me, because calculating the usefulness of each build option takes time and takes me away from the fun parts of the game that I want to be spending my time doing. Also, the game developers could’ve grouped improvement together based on their effects (e.g. all improvements that will increase food production go into one section). They sort of do this, but it’s hard to notice. Your empire can hire upto 3 heros. The heros can either be assigned to a star-system, which results in various bonuses to research, production, etc. Or they can be assigned to a fleet, which will give it various attack/defense bonuses. They also level-up over time, and you can pick individual bonuses for each hero. They also cost money each turn. I don’t have much to say about the heros. The game uses “dust” as money. It seems to have some quasi-mystical properties, as well, but it’s mostly just used as currency. It also includes a variety of strategic and luxury resources. They give your empire various bonuses, and the more resources you control, the larger the bonuses. 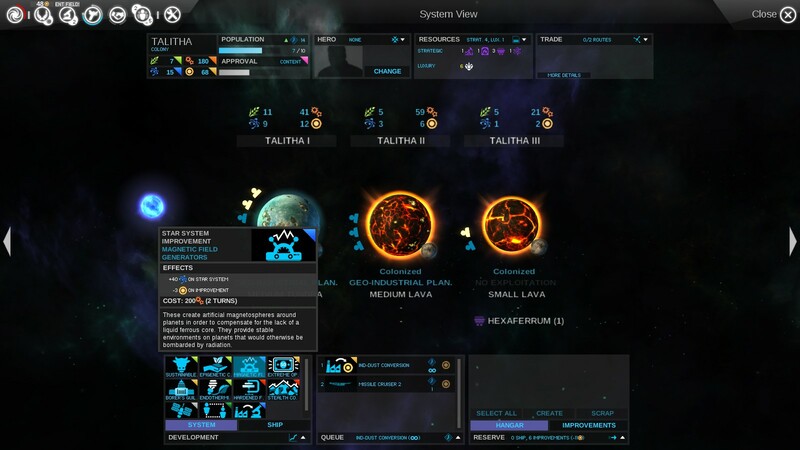 There are eight different resources, though, and almost every star-system has at least one resource. I tend to just ignore the resources and don’t take them into consideration when choosing which star-system to invade. They just end up being background noise. The game has three attack types: missiles, lasers, and kinetic weapons. There are three corresponding defenses: flak, shields, and deflectors. Ideally, you build fleets that use a weapon that the enemy doesn’t have defenses against (e.g. use missiles when he has no flak defenses), and you use defenses against the weapons the enemy uses (e.g. put deflectors on your ships when he uses kinetic weapons). You don’t know what attack/defense types your enemy uses until you engage in combat with him. Then, you can start customizing your ships to be most effective against that enemy. It’s an interesting dynamic. I did notice that the AI was customizing his defenses against my attacks (he started putting flak on his ships because I was using missiles). During combat, you can use various tactics that allow you to increase your defense or your offense numbers. Some tactics are effective only against certain weapon types (e.g. -25% damage from enemy missiles). Again, contextual help would be nice – for example, if the enemy fleet is not using missiles, then why not gray-out the tactics that reduce the damage from incoming missiles? The tactics give combat a little bit of variation because, otherwise, the outcome of every battle could be calculated beforehand. Still, I think they could’ve improved this part of the game, if only to make the effects of each tactic more obvious. I’ve played about 40 hours of the game, and I’m still a bit unsure about the tactics’ effects. For example, the “Offense: Weapons Overclock” description says, “+40 kinetics damage (block: +10%); -20 antimissile interception (block: +20%)”. What exactly does that mean? My guess is that my kinetic weapons do +40% damage. What does “block: +10%” mean? Does it mean that the enemy is +10% more likely to block damage from my kinetic weapons? Does “-20 antimissile interception” mean that the enemy is less likely to intercept my missiles, or does that mean that I’m less likely to block missiles coming at me? I don’t know. Overall, the combat is a little boring. You’re very interested in the outcome, but actually watching the combat happen isn’t very interesting. (You can do auto-combat resolution, which saves time.) It would be nice if you had cool-looking ships or if you could pick from a variety of ship images, but you can’t. This certainly isn’t Homeworld (which had some pretty cool looking ships). Still, the game does a good job of not having players spend a whole bunch of time on the ship-combat screen, which would take-away from time doing other things. One of the annoying aspects of the game is the fact that the it’s easy to retreat from battle. The AI started doing this thing where they would send a small fleet to a star I had captured. The game allows players to create a blockade, which prevents my fleets from leaving the star-system unless I defeats all his blockading fleets. So, this cycle happened quite a bit: he’d send in a fleet, blockade my fleet. I’d attack his fleet. His fleet would go into retreat (usually taking no damage), so he’d move back to his star. When his fleet reached his star, he’d send it back at my star. He’d do this with a bunch of fleets, effectively keeping my fleet pinned down. It wouldn’t be so bad if I could inflict some damage on his fleet, so he’d pay a cost for the strategy, but he’d usually manage to take little or no damage. I googled it and found a few people complaining about it. Here’s a battle report from one of these situations. My fleet is shown in the left, with a power of 6018. His fleet has a power of 383. So, my fleet is 16x his size. His fleet went into retreat. As you can see, he lost about half of his HP (shown by the yellow bar chart next to his fleet description). At least I did some damage this time, but it gets a bit annoying. If he keeps this fleet in his own star system for a number of turns, it’ll get fully repaired, at no cost. Also, I’ve spent 55 hours playing the game, and I think I’m just now starting to figure out what the battle report is saying. For a long time, I wasn’t sure if details like “Beam efficiency” was talking about me or my enemy’s combat details. 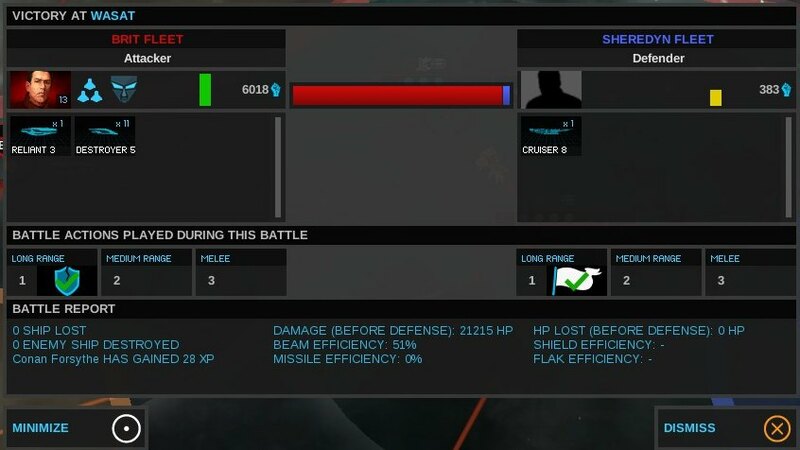 I think the “Beam efficiency: 51%” means that 51% of my beam weapons actually caused damage to the enemy ship. In other words, his shields blocked 49% of the damage that I would’ve done. This is just one of those things with the game – there are times where things seem cryptic and unexplained. I’m sure the game developers know exactly what those details mean, but that doesn’t mean players can easily decipher what that means. I also read elsewhere that missiles take a few rounds to hit, so if an enemy retreats, he can evade 100% of my missiles. None of this was explained on the interface, however. It’s just one of those things that you might figure out if you play the game long enough. A better user interface could fix this problem, though. The ship design works well. You choose what weapons, defenses, and extras to put onto your ship. You don’t pick where they go on the ship, and it doesn’t alter the appearance of your ship in any way. I’m fine with that. I don’t particularly care for game that make you pick where to place each ship component or decide which direction each weapon is facing. The game doesn’t require you to build troop transports or anything like that. Every ship seems to have an invasion ability. The star-system has a invasion-defense number. 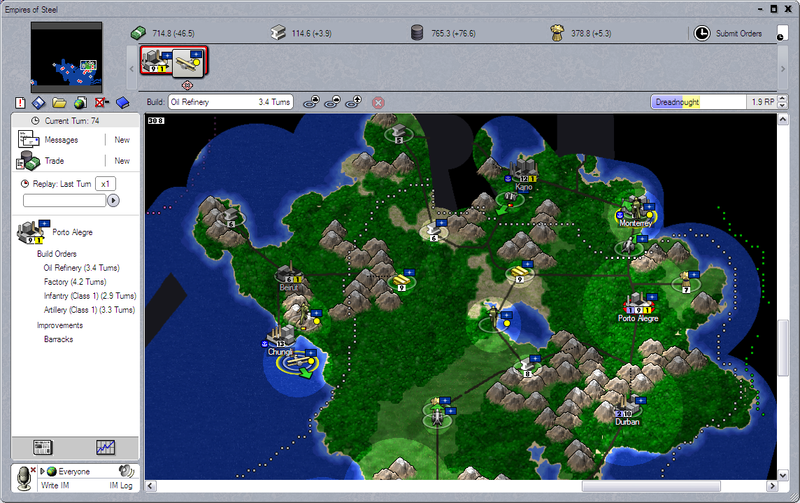 You put your ships in orbit around a star system, press the “invade” button, and an invasion value starts to increase. It might take you 10 or 20 turns to take-over a star-system. This depends on the number of ships you have, and whether you have any invasion-specific components on those ships. The planet can also build defenses which slows down the invasion. If you have a small fleet and you’re trying to invade a powerful star-system, you’ll never take it over in a reasonable amount of time. 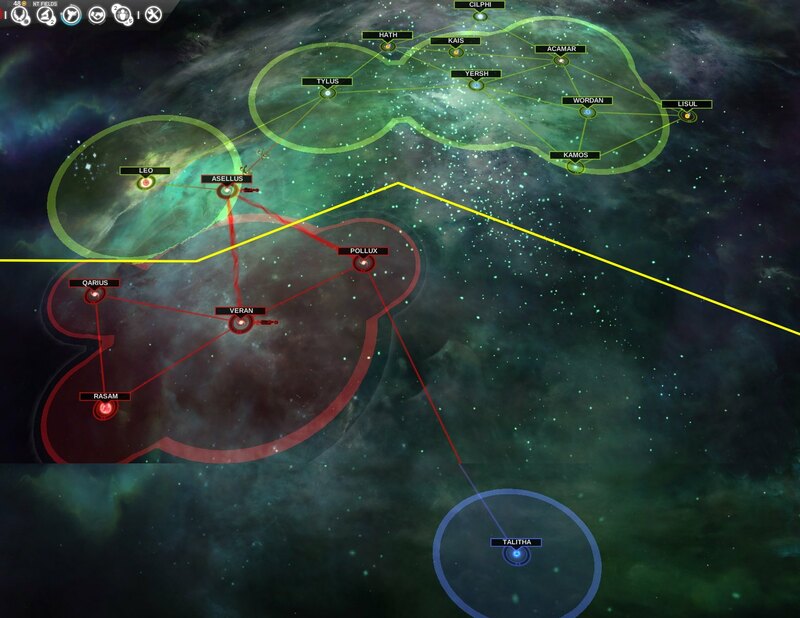 At any point, an enemy fleet can come into the star-system and attack you. There are no “hit and run” attacks, where you drop a bunch of nukes and leave. It’s a very minimalistic way of handling planet invasion. 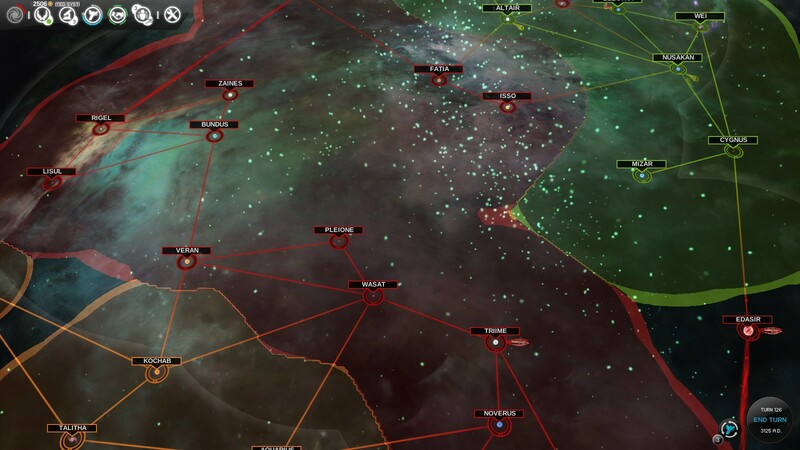 You’ve got the luxury of leaving major star systems undefended; you just need to be able to get your fleet there to counterattack before the star system comes under his control. If he does capture the star-system, the only real damage he can do is to destroy the improvements. On the flipside, if you’re going to invade an enemy’s territory, you know that you won’t be able to harm his planets or capture any territory gains without dealing with his fleet. 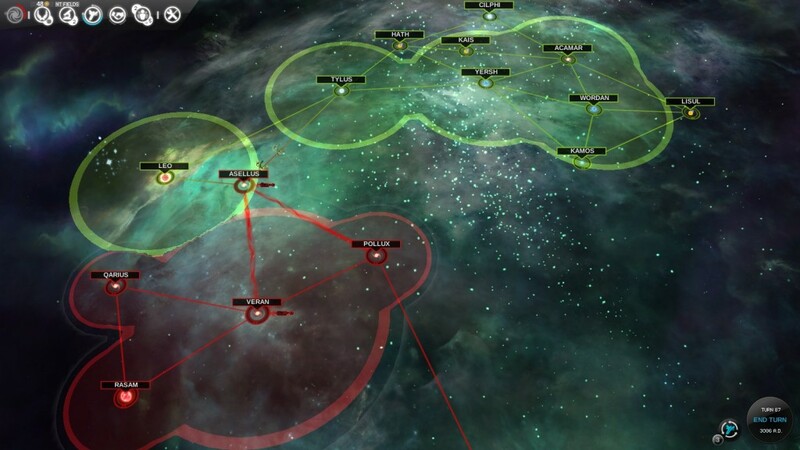 Typically what happens is that you declare war against an enemy, move your fleet to one of his star-systems to capture it, and then he’ll send basically all of his fleets to challenge you there. If you can successfully destroy his fleet, you can start moving onto other star-systems and capturing them, although it’s very slow because your fleet will need to spend a significant amount of time in each location to capture it before moving onto the next star-system. Once you takeover a star-system, the population will be in open revolt. You can’t build anything. You just have to wait it out and they’ll start to come around. The AI does well enough at playing, though he’s never very talkative. I think there was only once where the AI initiated contact with me – and that was to suggest a cease fire in our war. He never initiated a trade offer, suggested a trade route, asked me to remove my fleet from his star-system, suggested an ganging up on a third player, or anything else that might make sense if I was playing against human player. That’s fairly typical for 4x games, though. Very often, the AI designer has other things on his mind (like making sure the AI isn’t building something stupid or sending tiny attack fleets against larger enemy fleets), so the “talking” and “initiating” part of the AI gets forgotten about. Correction: on the most recent game I played, the AI was initiating trade agreements fairly frequently. The AI didn’t really accept or offer trade agreements unless they were strongly in their favor – like asking for an alliance while requesting a bunch of resources, even though I was much stronger than them. I ended up losing that game badly. I thought I was doing okay for a while, but when I declared war and attacked the AI, it became apparent that I had nowhere near the military power or technology that he did. All his additional stars put him way ahead in the game. Once I saw how much more powerful he was than me, I wondered why he didn’t attack me much earlier in the game, because he would’ve been able to take me out 50 turns earlier. Admittedly, a military victory isn’t the only way to win the game. He could’ve eventually won by an economic victory or a technology victory. The game is good overall, but not great. It’s better than what I’ve seen from the competition, though. 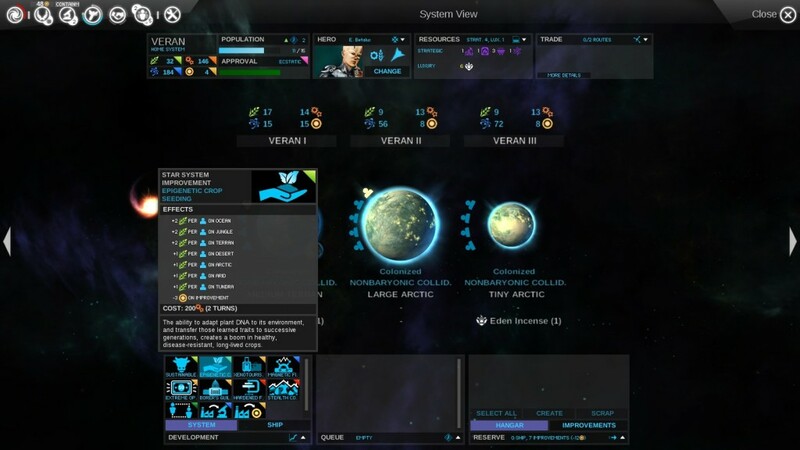 It should be interesting to see how Endless Space 2 turns out. It was announced about six months ago. This entry was posted in Game Reviews, Games by Brit. Bookmark the permalink. I can see that you have a tundra planet under the tool tip with 3 pop, this tech will increase food output in system by a minimum of 3 food for 2 dust, that is net gain and other modifiers will improve this as will when more people are on the tundra planet giving you +10 fids without other upgrades, more net gain. 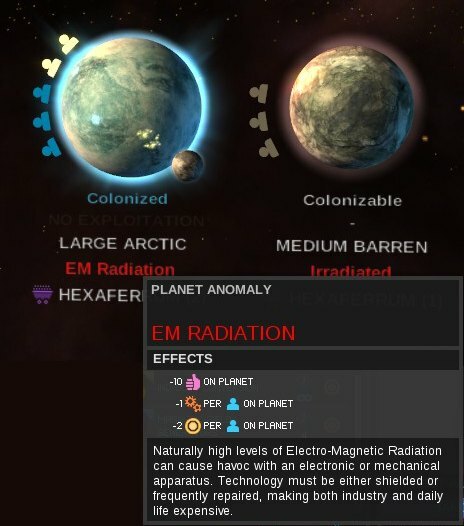 you cannot build an upgrade in a system unless it helps at lease one planet and no upgrade costs more in dust upkeep than it give in another fids (baring the trade upgrades and small one planet systems which should not matter because you should have another system generating spare dust to fund its upkeep). you whine a lot about the game not holding your hand or giving you information in a form that is less useful in long run but saves you doing a 1 second calculation in your brain, its almost like you don’t know what a 4x is. but mostly i don’t like the way you lie or misinform people in your review.